Reading and share top 12 famous quotes and sayings about Dubai by famous authors and people. Browse top 12 famous quotes and sayings about Dubai by most favorite authors. 1. "Dubai's world class physical infrastructure has already established it as a major player in terms of trade, tourism and as the leading conference and exhibition venue in this part of the world." 2. 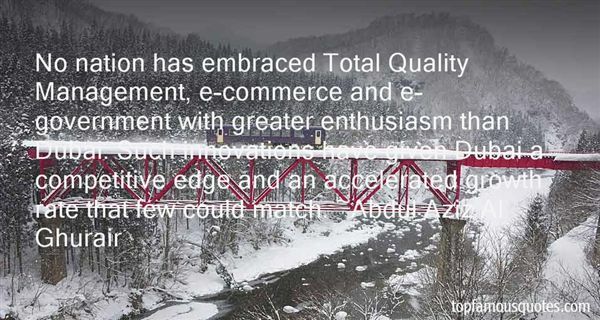 "No nation has embraced Total Quality Management, e-commerce and e-government with greater enthusiasm than Dubai. Such innovations have given Dubai a competitive edge and an accelerated growth rate that few could match." 3. "One of the main characteristics that differentiates Dubai from other commercial centres is its openness to innovation and the freedoms it grants people and institutions to operate." 4. 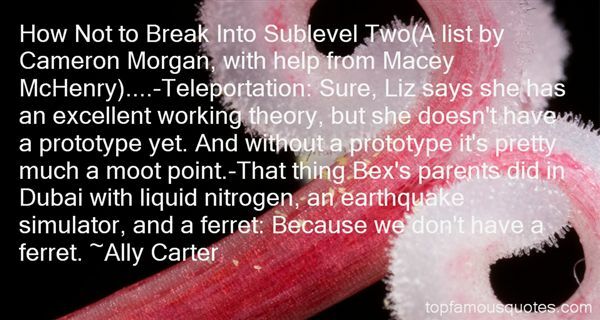 "How Not to Break Into Sublevel Two(A list by Cameron Morgan, with help from Macey McHenry)....-Teleportation: Sure, Liz says she has an excellent working theory, but she doesn't have a prototype yet. And without a prototype it's pretty much a moot point.-That thing Bex's parents did in Dubai with liquid nitrogen, an earthquake simulator, and a ferret: Because we don't have a ferret." 5. "My colleagues, while it is good that the Nation is finally focused on the critical issue of securing our ports, our rhetoric and our passion about Dubai must be matched by the funding necessary to keep our ports and our citizens safe." 6. "Dubai is... after all,a lonely, transitory place.It's hard to maintain relationshipswhen people are always coming and going." 7. 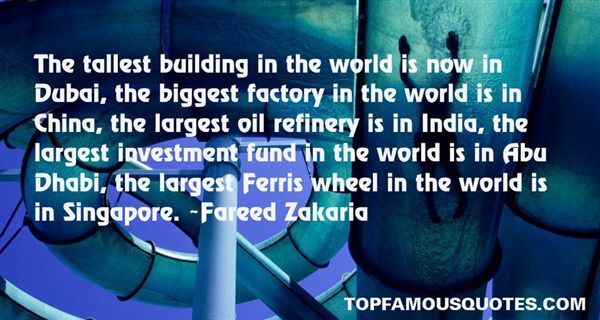 "The tallest building in the world is now in Dubai, the biggest factory in the world is in China, the largest oil refinery is in India, the largest investment fund in the world is in Abu Dhabi, the largest Ferris wheel in the world is in Singapore." 8. "Dubai was a property bubble. Plain and simple. Go to Dubai and see what happened. It was... what I call it the 'Edifice complex' - it's just, we can grow by putting up lots and lots of buildings and trying to attract people to come here, stay here, and put up offices here and sooner or later, you put up too many." 9. "The news today that Bush has vowed to veto any legislation that reviews the security implications of the Dubai Port World's potential management of our ports is ludicrous and the entire Democratic Party is calling him to task for it." 10. "I want Dubai to be a place where everybody from all over the world meets each other, don't think of fighting or hate, just love it, enjoy their sport, and that's it." 11. "Dubai was so special to me, Javi. You're special to me." "Being close to you like this after all these years...The way you make me feel...I want to get closer to you, and that scares me." 12. "I've been many times to Dubai and the U.A.E., and I have friends that live there. It would be exciting to stage world heavyweight championship fights in the Arab world. It's something Muhammad Ali achieved when he fought in Zaire or the Philippines. It's absolutely exciting to fight in countries where you have never fought." I'm very, very involved in charities involving youth."